With the increasing demands for higher capacity, more diversity and more personalization of services, the capacity and versatility of access networks needs to be expanded. Passive optical network (PON), as a major technology of FTTH, offers point-to-multipoint (P2MP) network access with lower installation and maintenance costs. EPON (Ethernet PON) and GPON (Gigabit PON) are popular versions of PONs at present. The related technologies keep developing and meanwhile the market of PON components keep growing. 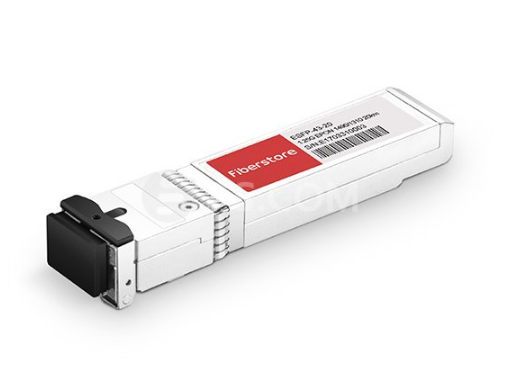 PON transceiver (EPON SFP or GPON SFP) is an essential part of PON system, in which a single fiber from a central office optical network unit (ONU) is connected to optical network terminals (ONTs) or optical network units (ONUs) at costomer premises. EPON SFP vs. GPON SFP is today’s main subject matter of this paper. Passive optical network (PON) is a form of fiber-optic access network. As the leading technology being used in FTTx (FTTH) deployments, so it is also called FTTH (fiber to the home) network. The typical PON arrangement is a point to multi-point (P2MP) network where a central optical line terminal (OLT) at the service provider’s facility distributes TV or Internet service to as many as 16 to 128 customers per fiber line. A PON reduces the amount of fiber and central office equipment required compared with point-to-point architectures. PON only uses fiber and passive components, thus it costs significantly less than those using active components. However, a PON has a shorter range of coverage limited by signal strength, which is typically limited to fiber cable runs of up to 20 km (12 miles). There are two different solutions developed by the IEEE and ITU-T – EPON and GPON. The main differences between them lie in the protocols used for upstream and downstream communications. 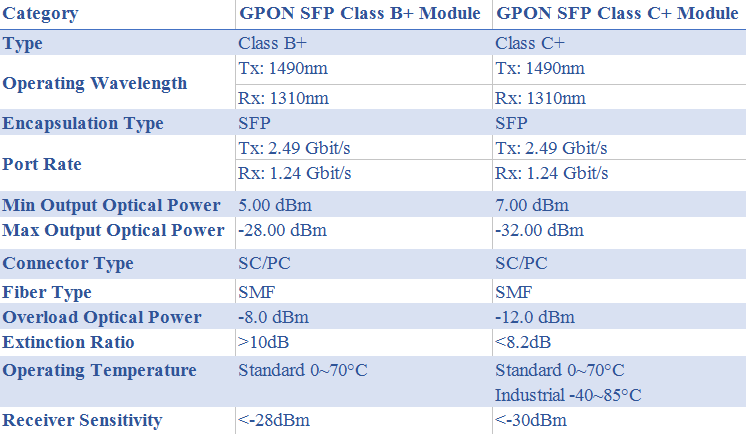 The following table shows the detailed information about EPON vs. GPON. PON transceiver is a bi-directional optical transceiver that uses different wavelengths to transmit and receive signals between the OLT at the CO and the ONUs at the end users’ premises over a single fiber. According to the pluged-in device, PON transceiver can be divided into OLT transceiver module and ONU transceiver module with SFF, SFP/SFP+ or XFP package. Here mainly introduce two common OLT transceivers used in GPON or EPON network: GPON SFP and EPON SFP. EPON SFP transceiver is the family of high performance optical modules providing a symmetric 1.25 Gb/s downstream and 1.25 Gb/s upstream data link over a single fiber using a 1490 nm continuous-mode transmitter and 1310 nm burst-mode receiver. The transmitter section uses a 1490nm DFB laser for superior performance and is Class 1 laser compliant. The receiver section uses a 1310nm APD, pre-amplifier, and limiting post-amplifier. The receiver does not require a reset pulse between incoming optical packets of varying signal strength. EPON SFP OLT transceivers support 1000BASE-PX20-D for 20 km applications. In terms of OLT module, there are many similarities through EPON SFP vs. GPON SFP, such as type of laser, transmission distance and communication model. The key difference among them is the sending power and receiver sensitivity. The sending power of GPON SFP Class B+ is 1.5~5dBm, and its receiver sensitivity is -28dBm while the sending power of Class C+ is 3~7dBm and receiver sensitivity is -32dBm. The sending power of EPON SFP is 2~7dBm and its receiver sensitivity is -28dBm. For GPON SFP, the upstream bandwidth is scalable from 155Mbps to 2.5Gbps while the downstream is designed to deliver 1.25Gbps or 2.5Gbps. It is the most widely used consumer broadband service in FTTH networks of present times. On the other hand, EPON SFP supports symmetric bandwidth of 1.25Gbps in both the upstream and downstream directions. Through EPON SFP VS. GPON SFP, we can see that they are the same in architecture but for different data rate and applications. In terms of cost, The GPON SFP optical module is more expensive than EPON SFP. Because the GPON chipsets available in the market are mostly based on FPGA (Field Programmable Gate Array), which is more expensive than the EPON MAC (Media Access Control) layer ASIC. When GPON reaches deployment stage, the estimated cost of a GPON OLT is 1.5 to 2 times higher than an EPON OLT. For the users who have demands of multi-service, high QoS and security, as well as ATM backbone network, GPON SFP seems to be an ideal. And for the one who is much care about the cost and has less security requirements, EPON SFP may be better.